Kerin Bailey was born in Kadina, a rural town 150 kilometres north west of Adelaide, in 1949. He commenced piano lessons at age seven and his interest in jazz dates from then. He began playing for local dances and concerts at eleven, a key element in developing his improvisational skills. 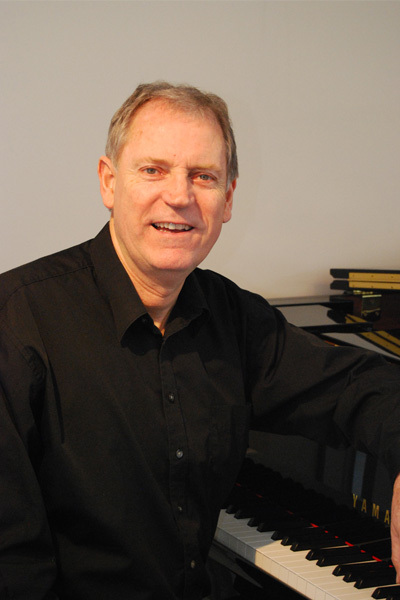 In 1978 he graduated from the University of Adelaide with an Honours degree in music, majoring in Classical piano performance under renowned concert pianist and teacher Lance Dossor. Trumpet was studied as a second instrument and later flute and violin. Since then he has enjoyed a varied career in music including eight years as a music lecturer with TAFE, contracts with the University of SA, and continues to be in demand as a professional musician and teacher. Composition initially came in response to a practical need – recital pieces for students and collaboration with writer/lyricist Dave Brown on several critically acclaimed youth musicals. The experience of working at close hand with young aspiring musicians has enabled Bailey to refine his unusual skill of being able to compose in a way which is not only musical but also accessible to students in the early to upper intermediate grades. His classical training ensures all pieces are composed using proven classical techniques. Bailey’s introduction of syncopated freshness and originality – a cross-over mixture of jazz and classical styles – has also made his music attractive to examining bodies around the world. Commissions include organ and vocal works for Trinity College London; piano, trumpet and saxophone pieces for the AMEB; music and a CD for the Gillian Rubenstein play Each Beach; and arrangements for the CD A Golden Christmas for flute and harp (Move Records MD 3169). He has worked with some of Australia’s leading jazz musicians and popular artists such as James Morrison, Kate Ceberano, Frankie Davidson, Judith Durham, Tony Pantano and Normie Rowe. He is especially noted for performances of jazz standards with a ‘classical’ touch, and the Kerin Bailey Trio dazzles audiences with tasteful, ‘swinging’ arrangements of well-known classical works by composers such as Bach, Mozart, Beethoven, Debussy and Ravel. His first published work, Jazzin’ Around 1 appeared in 1982. This was followed by a string of highly acclaimed youth musicals with writer Dave Brown (as yet unpublished). Since 1991 there has been a steady output of publications in the music education/leisure genres, including CD and midi recordings of all works – for all popular instruments. In 2001 Kerin Bailey Music published Bass Odyssey by top Australian bassist and teacher Shaun Duncan; this led to distribution rights to well known drummer Laurie Kennedy’s publications A Guide to Exploring Rhythm, A Guide to Developing Drum Kit Language and Drum Set Duet and Trio. Kerin’s most recent publications are Rhythm Unravelled (2003), Jazzin’ Around for Strings – Violin, Viola and Cello (2005), Jazzin’ Around 6 for Piano (2009), Five Dances for Flute and Piano (2010) and Drowsy Bees and Butterflies Piano Solo (2017). Kerin continues to compose, run Kerin Bailey Publishing, teach piano and accept engagements as a professional musician.